When we first seriously started coming up to the Costa Brava to see properties, we found a hotel deal in the Balneari Vichy Catalan in Caldes de Malavella. This won't make a bit of sense until you discover that Vichy Catalan is the most popular prestige mineral water in Catalonia and a Balneari is a hotel with natural mineral water spa and baths, in this case with natural thermal waters. In the early part of the 20th Century prior to the 1930s, the prime resort and holiday locations for Catalonia weren't the sea or the coast, but water spas and water health treatments (similar to Bath or Malvern in the UK which had been established since the 18th Century). 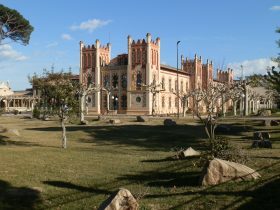 Towns like La Garriga closer to Barcelona and Caldes de Malavella became popular luxury resorts catering to the wealthy (other towns called Caldes also have hot springs, as does Badalona). 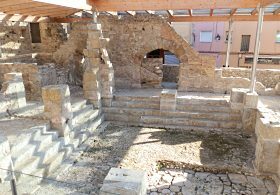 Caldes de Malavella is also a Roman town, a staging point on the Via Augusta that links Cadiz to Rome and as such it has the remains of the original Roman baths. It actually has several hot springs and several Balnearis in the town - one public and three others that have been taken over by spa-hotels or for hospital use - thermal and mineral waters for a long time have been considered to have health properties. These types of spa and the use of mineral water for health benefits are extremely popular in France known as thermalisme and for preventative purposes thalassoterapie. So a local entrepreneur started bottling the water and named it after the most famous French Spa - hence Vichy Catalan. (Side note that Vichy, just north or Clermont Ferrand is a worthwhile overnight town if you are driving between the UK and Spain). From the time, and because of the type of people who took the cure, the hotel for Vichy Catalan itself is very grand, built in a modernista fashion with parkland and is just next to the station. Unfortunately, somewhat later the company built a rather ugly bottling plant right next to the hotel so its splendor is diminished if you get the wrong viewing angle. As mentioned it's not the only spa - Balneari Prats closer to the centre of town also offers a naturally heated outdoor swimming pool/spa. And there are actually several brands of mineral water companies from here - San Narcisco, Imperial and Malavella. The reason for this walk though was the train station. Caldes de Malavella is now the most practical station for trains to Barcelona and Barcelona airport. Until the dualling of the C66, most people would have recommended using Flaca for trains, but with an easy quick ride, Caldes saves about 5 stations and half an hour on the train. 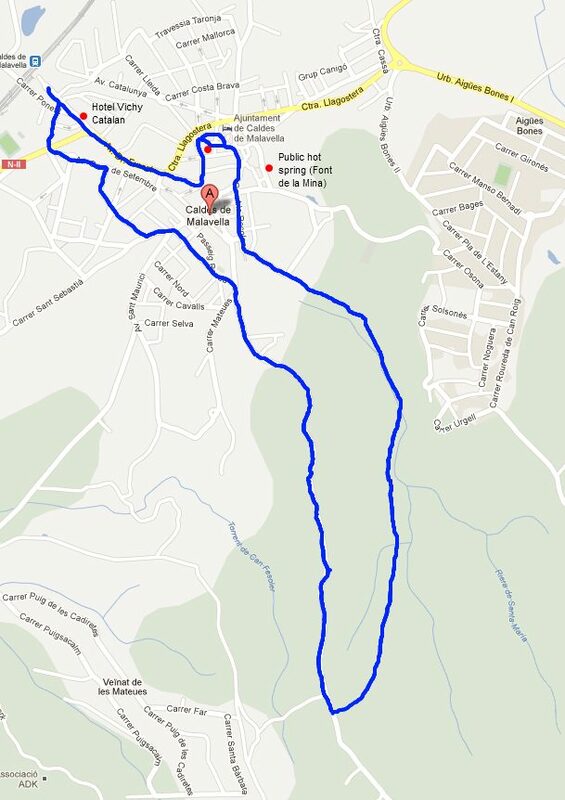 The walk starts at the station, and heads into town past the Balneari Vichy Catalan and across the main road and then past Balneari Prats. The town itself is not tourist-y and relatively small and indistiguished. However take the chance to explore and find the Roman baths and the church and some of the remaining markers from the town's former heydays. To head out of town we followed the Rambla Recolons which turns to the left to become Rambla Rufi before finishing in a field. Walk across the field and follow the path through the woods following a small stream. We then found a path to the right up away from the stream and followed this until we reached a sand-track road at the top. From the road there are views across the valley of the Onyar south of Girona and across to snow capped Pyrenees (it's February which is the time of most snow - last year it reached down to the coast - but normally it's mild on the low lands with snow in the far distance). We then followed the path back and through some of the new estates through town. In fact Caldes is surrounded by a number of urbanisations (housing estates), but with poor connections between the urbanisations and the town itself. We find ourselves walking through a lot of estates and while individual houses can be quite striking, the overall impression is often of a mish-mash of isolated houses with relatively few facilities. Whereas UK estates tend to be built by one developer and so have a unified look, Spanish and Catalan urbanisations are usually sold as individual plots of land. Consequently they have a wide variety of building looks and types with not much thought to creating a coherent look, and with most of them built on a grid system, they can feel like they lack a centre and amenities. For a town like Caldes it means much of the population is not in the centre making the whole town feel disjointed despite its historic attractions.